Classic blue blazer from Sears! Yes, you heard me right! I know, I know, I spelled seriously wrong. I did it on purpose because I am so excited about my new blazer from Sears. Yes, you heard me right, Sears! Who knew? I have been looking for a cute blue blazer to complete my wardrobe when I stumbled across this gem at Sears. It is Land’s End brand- so I know the quality it excellent- and the price was the best part. Originally $189, I snapped this baby up for $50. It was on super clearance. Now hurry- go to Sears and get your own! Keep in mind, it runs small. I love the style book- The Lucky Guide to Mastering any Style. In this book they talk about different style inspirations and help you determine which one best suits you. I am American Classic. I love everything about that look- and this outfit is a perfect example of that. 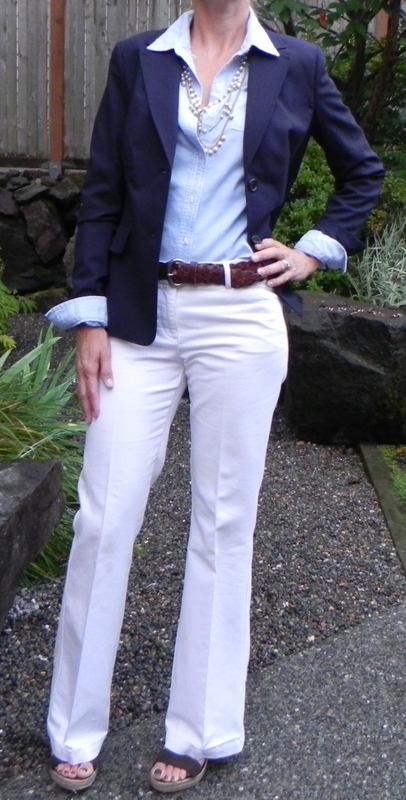 Crisp white pants, a chambray blue button down, blue blazer and a strand of pearls. Can’t get much more classic that that- can you? What style are you? Check out the book to see! Off white pants are appropriate all year round. What a steal. I’ve been working with Lands’ End a lot lately. Love how the looks are evolving for both those brans. I know- it’s fun to see what they have- the current look is almost ‘J Crew-ish’. Love it! I know, my sister calls me the Headless Housewife! Winter white is one of my fave “colors” to rock! Gorgeous look! Winter white is one of my favorite “colors” to rock! Gorgeous look! Cute look! I’ve been meaning to run in and check out the Lands’ End stuff. They have super cute kids stuff too! Lovely! All these affordable collections are so amazing. There’s really no reason to break the bank unless you see something you really want. Sears, Target, H&M, etc are doing a great job. You look so polished. Thanks Glamamom! I love your site so much I added it to my blog roll! Great Look!! I love “super deals” like these. Of late, I’ve been finding myself buying accessories at JC Penney. Reasonably priced and trend right. I know! I never dreamed I’d be shopping at Sears for clothes but the Lands End line is adorable! Did you see my blue and white dress from yesterday?